I know you're real busy but I was wondering if you could make a Kyron photo with a birthday cake for his birthday on the 9th. Yes, I know it will make me cry, but I think it will be great to see one, with all of his frog friends around! 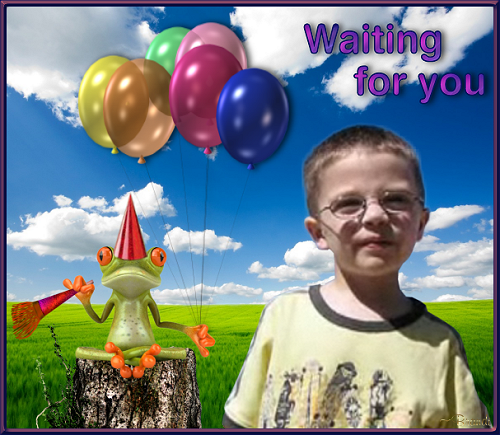 I have made a birthday image commemorating Kyron's birthday. But it has no cake in it. Maybe I'll make another one as well. Do you have a favorite photo of Kyron that you would like me to use in it? This is one of my favorites, but what ever you pick Brandi, will be great! It's a great picture, I agree, but he is so young in that one. 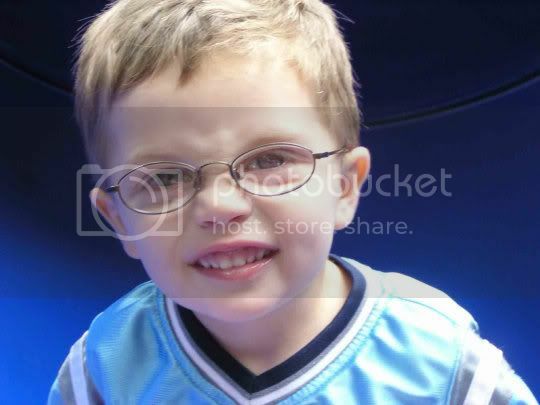 I was thinking a more current picture would be better since he is turning 8. I'll see what I can come up with. If I don't use that one, don't be offended. piled on one another - giving a community hug. I was hoping "we" could post the group hug for AZSunny. I am afraid I have no idea what picture you are talking about. Where did Grama post this picture and when? Grama posted it on Haleigh's thread, about a year ago. Thank-you for asking me, I will go and browse Haleigh's threads. that when I grew up! I guess now if I don't use my head, I use my fingers. Yes I passed everything on. The picture was adorable. If I thought it would upset her I wouldn't tell her, but that picture definetly wouldn't. Thank you so much, sassifrass. 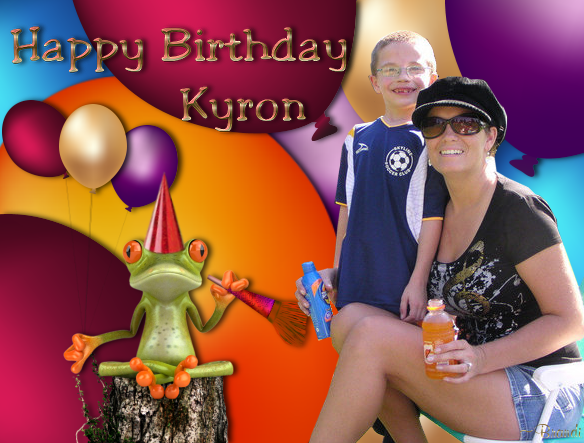 I have been working on birthday pictures for Kyron. I have made 6 or 7. Here's a private (this thread only) preview of one of them. I got this picture of Kyron (I had not seen it before) from a video from the Today Show yesterday. Doesn't look like a pile of monkeys hugging, nor do I know what you'd like me to do with it IF it is the one you meant. 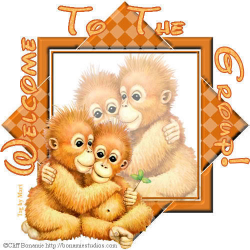 Oo oo oo, I love your work, and am so excited to to be a Scared Monkey! I've been drooling over everyone's fab avatars, and am wondering if you can help me out? If so, I'd love a avatar of Koko the Gorilla with her kitten. The thing is, I'm wondering if these are all copyright protected? Here's a link to a google images search for Koko's cat. Didn't know where else to start. It's tough because Koko's so big, and her kitten's so small... can't figure out how to get them both to show up in an avi. I've especially been raving about the humor in the Monkey King's avatar down by his signature... love it! It cracks me up.. Thanks so much for your time! I could never figure this out! Hi Kokos Cat, and welcome to the forum! Let me see what I can come up with for you. I must admit I have not heard of Koko and her kitten. I'll do some searching and see what I can come up with. I'll post tonight or tomorrow. Again, welcome to the forum! I came up with 2 designs, one summer, one Autumn. Both have a framed and non-framed version. That was so fast! I'm amazed! I love the autumn one (no frame). So cute, All Ball is blinking! Yes! Thanks!!!! Will you post it on Sunnys condolence page, if you find it appropiate? Brandi you so dedicated to others, I want you to know how I appreicate you time and Saintly patience. Maybe with his frog friends and a birthday cake. Also thought of adding some personal things that Kyron likes. We know he like mac n' cheese, sushi, soccer, science, math, etc. Anything you can do would be great Brandi! Can I use that pic as a flyer? I told her absolutely. Hope that is ok Brandi. OMG! I LOVE these Brandi! Do you mind if I send them to Desiree? If you think it is appropriate, sure.